Guest blogger from EarthCorps, an NBI Innovation Partner. There’s nothing quite like lying face down in rich, organic marsh mud to really feel a connection with the earth. My arm is at its full reach down into the mucky pit we just dug alongside our soil core sample, my fingertips barely reaching far enough to convince the corer to release its grip. 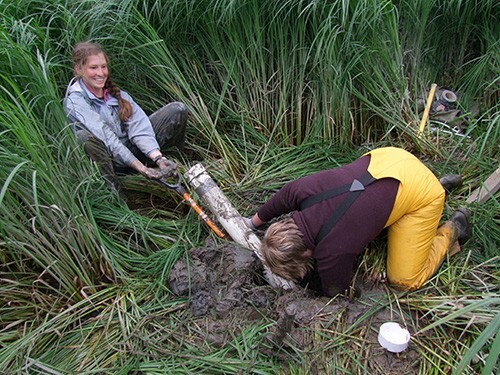 Finally, my colleague and I pull the nearly meter-long, mud-filled tube out of Quilceda Marsh. We are just 10 miles from the largest airplane factory in the world, but we are surrounded by lush sedges and bulrushes, and constant birdcalls. 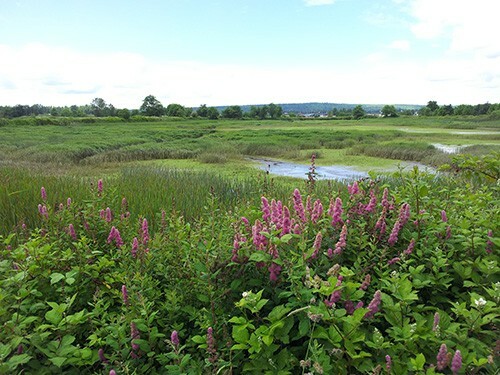 In partnership with Restore America’s Estuaries’ national Coastal Blue Carbon project and with support from the Tulalip Tribes, we are sampling soils in one of the most pristine marsh habitats in Puget Sound, the Snohomish River estuary near Everett, WA. These samples are part of a key study that quantifies the climate benefits of wetland restoration (known as blue carbon) on an estuary scale for the first time, with funding from NOAA’s Office of Habitat Conservation, The Boeing Company, and the Wildlife Forever Fund. Our study focused on soils, where most of the carbon is stored in wetland ecosystems. The Western Washington University soil team led by Dr. John Rybczyk, and the projects’ lead carbon scientist, Steve Crooks at Environmental Science Associates, analyzed the soil samples to determine the future carbon storage potential of the Puget Sound estuary system, taking into account predicted sea level rise and potential management scenarios. The results suggest that CO2 sequestration per hectare in these marshes (approximately 800 to 1,000 tons per hectare) exceeds that of nearby mature Pacific Northwest forests (200 to 700 tons per hectare), considered the most carbon-dense forests in the U.S. If these wetlands were restored before sea level rises in next 100 years, there is significant potential to double the amount of carbon sequestered in the marshes. How much carbon is 2.5 million tons? That’s the equivalent of one year’s emissions from 500,000 passenger cars. We’re talking about storing 8.9 million tons of CO2, the equivalent of 1.76 million cars. That’s almost as many cars as are registered in Snohomish and King Counties – the most densely populated part of Washington State. This is where blue carbon gets really exciting! We already knew that wetlands have the potential to store up to five times as much carbon as forests on a per acre basis. These results also emphasize that it is highly advantageous to restore wetlands sooner rather than later - because we can pack carbon-storing plants and soils into areas that will eventually be submerged under rising seas. These restored plants and soils will keep the carbon locked in, even underwater. Looking southwest across the City of Marysville marsh mitigation site towards Port Gardner in the Snohomish River estuary. Waiting until waters rise will make it much more difficult to get plants established, and there is the possibility that soil erosion could occur in these submerged marshes, releasing some of that stored carbon. So the message is clear: restore wetlands, sooner rather than later, to optimize carbon sequestration in Puget Sound. This methodology is transferable across Puget Sound, as well as other parts of the U.S. with huge biocarbon opportunities. Just imagine if we could apply blue carbon to the wetlands along the Gulf Coast. When that happens, I’ll be the first to volunteer to sample the soils. My boots are packed, though I may need longer arms! Keeley O’Connell is a senior project manager at EarthCorps. Contact Keeley O’Connell at [email protected]. Keeley is Senior Project Manager at EarthCorps.